There is a story in today’s Guardian newspaper which indicates the depth of the Labour Party’s financial difficulties. The story suggests the leaders may become personalll liable for tens of millions of pounds of debts if loans totalling £17million plus interest are not repaid soon. As with alot of newspaper stories I suspect that this is partly true but in my view it is highly unlikely. The Labour Party has links with many ultra-rich multi-millionaires some of whom are on record as saying they will support Labour to whatever extent is necessary. I guess that local Labour Parties are finding it more difficult to raise funds and I think that the fact that Labour are still so heavily dependent on handout from the Unions is not a healthy situation for them…..or our Country. Today should be interesting at home as we have had notification that the electricity is to be swirched off all day whilst repair works are carried out and as everything runs on electricity here ( including of course my computer ) I will be off for at least part of the day to our Constituency Office where hopefully the electricity will be on. In the meantime I am off to make a flask of coffee for the day! Posted in Politics	| Tagged Labour Party funding. I am pleased to report that CeeCee passed his inspection at the V E T’s he was fairly well behaved for his injection and by the end of this week we will be able to start taking him out. It has been a fairly quiet couple of days this Bank Holiday weekend. I only had one engagement yesterday a Sunday Lunch at Greenmount Golf Club organised by the North Manor Ward Conservatives. Numbers were a little down on usual with alot of people away because of the Bamk Holiday and school half term holidays but there were still well over 60 and we had an enjoyable lunch followed by entertaining speeches from Councillor Jack Walton and his wife Pat who have recently finished their two year stint as Mayor and Mayoress and then Deputy Mayor and Deputy Mayoress of Bury. I spent all day yesterday with a group of us from Bury North helping out on polling day at the Crewe and Nantwich by-election. I then stayed up until 3am to watch the result and I am not surprised that the Conservative Candidate Edward Timpson was successful. I am surprised by the size of his majority. Edward is intelligent and caring and will make an excellent Member of Parliament. The result showsa that thousands of voters were unconvinced by the constant Labour attacks on the Conservative Candidate just because of his background. I saw alot of Labour literature and there was very little mention of Labour policies and achievements. As for the Liberal Democrats there literature continues to give the impression that they occupy a parallel Universe. Yesterday they distributed a newspaper with the headline ” Liberal Democrats set for amazing by-election win” Hmmmm. well not quite. I think claims like that just make you look silly when it was quite clear to everyone that a Liberal Democrat win was in reality rather unlikely. Sue and I are off ti take CeeCee to the V E T ‘s this morning for another innoculation. Then I shall be getting back to my own work and listening to the Second Test match. After another trip down to Crewe and Nantwich yesterday I went in the evening to St. Anne’s Mothers’ Union in Tottington as they had asked me to speak to them about my life and being a Parliamentary Candidate. I spoke about my life and how I thought my upbringing had shaped the values I have today. It was a well attended meeting and I had several interesting questions to answer ranging from whether I thought William Hague would make a comeback as Conservative Party leader to how I would have voted in the free votes issues currently before Parliament. I have had a typically busy weekend with a round of events. On Friday night I attended a Bow Group Dinner where the main speaker was North West MP Nigel Evans. Nigel gave us a thoughtful insight of the current political situation. Although he currently has a five figure majority in his Ribble Valley seat it was not always so and of course when he first fought it in a by-election he lost to the Liberal Democrats. He then won it back in the General Election the following year. Talking of by-elections I went down to Crewe again on Saturday after first calling by to thank and encourage the Royal National Lifeboat Institute (RNLI) volunteers who had a lifeboat on the Rock to help them collect funds. My wife Sue was one of the volunteers and I left her rattling her bucket as I made my way down to Crewe. I saw alot of activity from Labour and ourselves but to be honest not much from the Liberal Democrats although as usual they had alot of posters about. We did manage to finish our duties in time to catch the end of the FA Cup final on a televsion in a local pub. On Saturday evening my wife and I were invited to dinner at a friends house so I could relax with only the occasional reference to politics. Sunday was the Civic Sunday at the Parish Church with the new Mayor and Sue and I attended. The Service is part of the normal Sunday morning Communion Service and was well attended. I should perhaps report on CeeCee’s progress. The first thing to say is that our “little” dog is already growing noticeably. He is fairly well behaved most of the time and I think we are having reasonable success with his toilet training. We are being quite careful to try and take him outside every couple of hours even though this does mean getting up two or three times in the night. I was up at 3am to help Sue with him last night. Today, I am hoping to catch up on some paperwork in my office I have a speech to write for tomorrow and if they are playing I will hopefully be able to listen to the Test Match Special commentary on the first test from Lords. It looks like a draw but you never know in cricket. 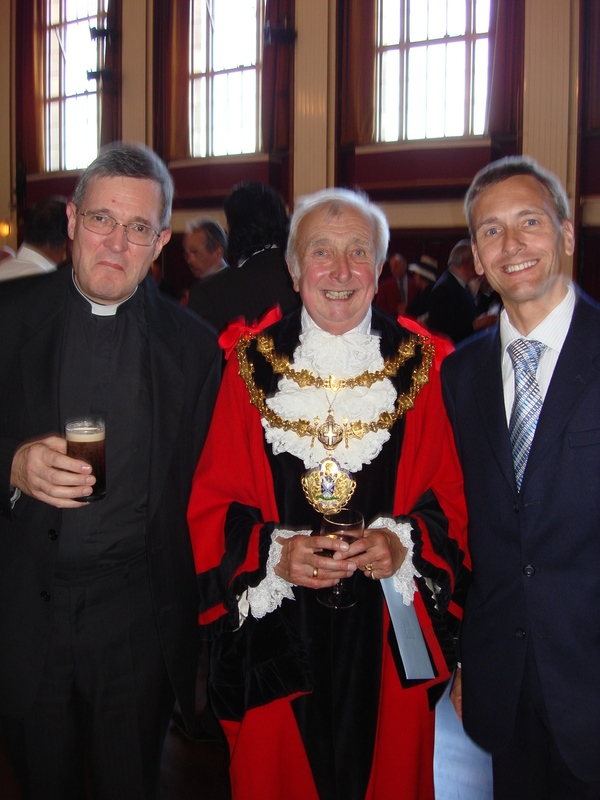 I was honoured to be invited to the installation of the new Mayor of Bury on Wednesday. Councillor Peter Ashworth was sworn in as the new Mayor and I am sure he will carry out his Mayoral duties with great pride and dignity. Yesterday, I paid a visit down to Crewe to help in the by-election. The response on the doorsteps is quite positive although it is also quite unusual. I guess most politicians are used to hearing the refrain of “We never see anybody here” well in Crewe at the moment the most usual response is “Oh dear not another one!”. Hundreds of campaigners from all parties are descending on what after all is quite a small town and I would have thought the local economy is receicing a real boost from all the election activity. On Saturday I paid a second visit to Crewe to help in the by-election. Glorious wether again and I found lots of life long Labour voters who were quite happy to chat to us. Most will not change their voting habits this time but there is no doubt that some will. What is encouraging is that this minority seem ready to switch straight to voting Conservative. I guess many will simply stay at home and not vote at all. On Sunday it was the Whit Walk after Church and again as the sun was shining brightly it was very well attended and hundreds of local residents came out to watch the band and the procession as we made our way through Tottington.